Modic changes (MC) are bone marrow lesions seen within a vertebral body on magnetic resonance imaging (MRI), suggestive of being associated with low back pain (LBP). Their presence in clients receiving physiotherapy for low back pain may be of significance when discussing prognosis and benefits of exercise therapy. Research on the subject has been published since 1988 when MC were first identified by Dr. Michael Modic. Subsequent publications on the subject provided incremental gains in understanding of this new diagnostic entity. Though causes and mechanisms responsible for formation of MC are still poorly understood, progress is being made in linking his spinal phenotype with disc degeneration and LBP. This is significant because currently the value of MRI in management of LBP remains low due to lack of phenotypical features strongly correlating with clinical symptoms. Type II - fatty replacements of the red bone marrow within vertebral body. Type III - subchondral bone sclerosis. Same authors postulated that the types form a continuum along which the disease process will progress. Estimate of 18-24 months was provided for transition form type I to type II though others feel that much larger longitudinal studies are required to support this idea. Fig 1. Modic changes. Modic type I change: hyperintense on T2WI (A↘), hypointense on T1WI (B↘) at inferior endplate of L4. Modic type II change: hyperintense on T2WI (C upper↘), hyperintense on T1WI (D upper↘) at superior endplate of L3. Modic type III change: hypointense on T2WI (C inferior↘), hypointense on T1WI (D inferior↘) at superior endplate of L4. MC were found to be an independent predictor of intense and disabling low back pain episodes in women. Physical examination findings may not be useful for differentiating between clients with and without MC and characteristic of degenerative disk disease. MRI is the method of diagnosing MC, however x-ray imaging is helpful in differentiating from spondyloarthropathy. LBP client subgroup with MC has shown to be still experiencing a moderate pain intensity on 6 month follow up despite treatment. It may be advantageous to our patients if knowledge of association between MC and more persistent and disabling pain influences education, physiotherapy goal setting, resource intensity planning, as well as risk/benefit ratio discussion when obtaining informed consent for physiotherapy intervention. The numerical rating scale (NRS) measures current back pain on a 0 to 10 scale. The Roland Morris Disability Questionnaire (RMQ) is a 23-item disability questionnaire with a 0 to 23 scale, measuring activity limitation. EuroQol (EQ-5D) is a standardized instrument measuring health status-related quality of life consisting of a health status index (EQindex 0 to 1 scale) and a visual analogue scale (EQVAS 0 to 100 scale). The global assessment transition questionnaire measures the patients' perceptions of the overall change in their back pain since the beginning of the study on a 7-point Likert scale. Days lost from work due to pain. Conversely, the study did not produce any evidence of harm due to standard exercise therapy and recommendation to maintain normal physical activity level when possible. The results of this high quality study and its implications on practice should therefore be interpreted in broader context of a specific client's physiotherapy goals. Kelly Wong, your potential client is a 51 year old female, overweight (BMI - 29), otherwise healthy registered nurse (RN), working full-time at the Palliative Care Unit in a local hospital. You had the pleasure to meet her 4 weeks ago when in addition to standard pharmacological treatment, she received referral to physiotherapy and requisition for MRI from her general practitioner. Kelly shared with you that she had experienced LBP twice before in last 10 years with most recent onset 4 months ago. She decided to access healthcare due to symptom intensity and duration exceeding those she recalls form past flare ups. Kelly feels positive about her progress with physiotherapy treatment and attends her appointments regularly. Despite her undeniable compliance with your recommendations you were not able to document any significant changes on any of the standardized outcome measures you use with this client. She just had a neurosurgical consult at which she was informed that her MRI confirmed DDD without neurological tissue compromise at L4-5 level. Her neurologist noted MC in both L4 and L5 vertebral bodies and briefly discussed significance of this finding with Kelly. She was relieved by the fact that surgery was not necessary but very concerned to find out that MC put her at greater risk of more significant symptoms and disability. She was advised to continue with current treatment and report any worsening or new symptoms. Kelly's main concern at the moment is that her gratifying but physically taxing profession has caused her back problems and continues to damage her spine. She fears that she has no choice but to retrain and find a sedentary role, risking a considerable loss of income. Kelly anxiously awaits your opinion. linking you with community and internet resources shown effective in assisting with attaining healthy body mass index. ↑ 1.0 1.1 1.2 1.3 1.4 Mok FP, Samartzis D, Karppinen J, Fong DY, Luk KD, Cheung KM. Modic changes of the lumbar spine: prevalence, risk factors, and association with disc degeneration and low back pain in a large-scale population-based cohort. The Spine Journal. 2016 Jan 1;16(1):32-41. 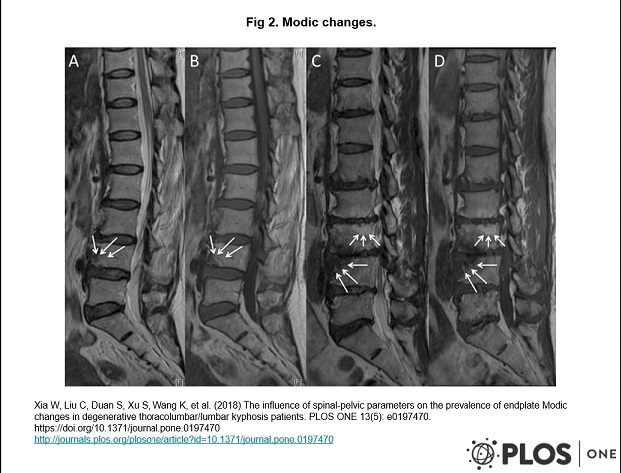 ↑ 2.0 2.1 2.2 2.3 Xia W, Liu C, Duan S, Xu S, Wang K, Zhu Z, Liu H. The influence of spinal-pelvic parameters on the prevalence of endplate Modic changes in degenerative thoracolumbar/lumbar kyphosis patients. PloS one. 2018 May 15;13(5):e0197470. ↑ Määttä JH, Wadge S, MacGregor A, Karppinen J, Williams FM. ISSLS prize winner: vertebral endplate (Modic) change is an independent risk factor for episodes of severe and disabling low back pain. Spine. 2015 Aug 1;40(15):1187-93. ↑ 4.0 4.1 Määttä JH, Wadge S, MacGregor A, Karppinen J, Williams FM. ISSLS prize winner: vertebral endplate (Modic) change is an independent risk factor for episodes of severe and disabling low back pain. Spine. 2015 Aug 1;40(15):1187-93. ↑ 5.0 5.1 Zhang YH, Zhao CQ, Jiang LS, Chen XD, Dai LY. Modic changes: a systematic review of the literature. European Spine Journal. 2008 Oct 1;17(10):1289-99. ↑ Fayad F, Lefevre-Colau MM, Rannou F, Quintero N, Nys A, Macé Y, Poiraudeau S, Drapé JL, Revel M. Relation of inflammatory modic changes to intradiscal steroid injection outcome in chronic low back pain. European Spine Journal. 2007 Jul 1;16(7):925-31. ↑ Jensen RK, Leboeuf-Yde C, Wedderkopp N, Sorensen JS, Manniche C. Rest versus exercise as treatment for patients with low back pain and Modic changes. A randomized controlled clinical trial. BMC medicine. 2012 Dec;10(1):22.